St. Catharine provides you and your family the opportunity to be involved and contribute so St. Catharine can truly be your church home. We have a vital parish that is alive & growing, and we want you to be a part of it. Our mission is to love one another as Christ loved us. At St. Catharine, we are proud of the involvement of our members. In addition to the joy you experience by getting involved, you will create friendships that will last a lifetime. Our parish is making a difference in the life of the community. 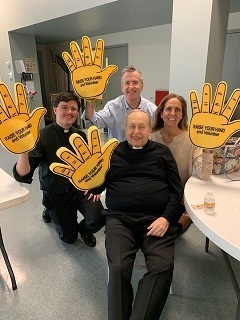 Our strong outreach initiatives are marked by love and are an essential quality of our parish. St. Catharine has so many ways to get involved. Whether you like to organize, bake, read or build, there are many opportunities for you to share your talents. We hope you will find a ministry (or two or three!) that appeal to you on the links here. Feel free to contact the ministry leader listed on each page or the staff moderator.